The Delaware Department of Natural Resources and Environmental Resources (DENREC) estimates that “more than 90% of Delaware’s waterways are Impaired”. Further, DENREC says that “most impairments come from nonpoint sources”1. Impaired waters are those that do not meet “Water Quality Standards” set by the US Environmental Protection Agency (EPA) for one or more of 11 designated uses in Delaware. Impaired waters are polluted waters. The Inland Bays Foundation (IBF) cares because we all need to help reverse the damages being done to our Inland Bays so someday they will be safe to use throughout. The conventional definition of “nonpoint source” (NPS) pollution is polluted storm water and irrigation water runoff moving over and through the ground into our surface waterways. Point source pollution “generally” is that which comes out of a pipe typically from industrial and sewage treatment plants. As the water makes its way to the Inland Bays it picks up and carries contaminants and potential pollutants like sediments, nutrients, toxins and pathogens. Often times the pollutants end up concentrating in various areas of the Inland Bays causing the water to be unsafe for drinking, swimming, fishing, crabbing, shellfish harvesting and more. Along with harmful toxins and bacteria build ups, one of the biggest pollutants is “highly enriched” levels of nitrogen and phosphorus resulting in massive weed and algae growth leading to harmfully low dissolved oxygen (DO) levels and harmfully high turbidity. Aquatic life, such as fish, crabs, shellfish, zooplankton and certain plants require a sufficient level of DO in order to survive. 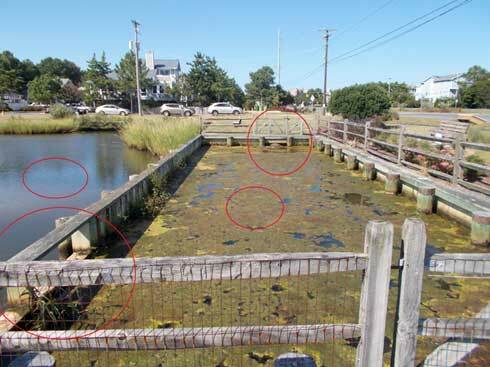 DO levels often go below those necessary for healthy aquatic life at various locations in the IB. It also contributes to infectious pathogen levels. The best way to control NPS pollution is to prevent it at its source. Some of the potential pollution falls directly from the sky in the form or rain already saturated with phosphorus and nitrogen. Some solutions to NPS pollution are as simple as using back yard rain gardens, lawn swales, rain barrels, and infiltration/bio-retention trenches. Also, the proper use and management of lawn, garden and farm fertilizers will contribute to cleaning our bays. Proper and controlled amounts of phosphorus and nitrogen are good for plant growth in farms, gardens and lawns. Oversaturated or highly enriched amounts of these nutrients are very harmful. The photo taken by Tony Caputo on September 7, 2015 is the Anchorage Canal Forebay (water with algae) and a portion of the Anchorage Canal (water without algae) in South Bethany. They ultimately connect to the Little Assawoman Bay. It is a good example where nonpoint source nutrient rich storm water runs into storm water drains and concentrates in the Forebay. The pipe entering the Forebay (the pipe is seen entering the upper right corner of the Forebay) is generally considered nonpoint storm water drainage. The Forebay then drains into the Anchorage Canal through the two openings in the lower left corner of the Forebay. The Forebay is designed for sediment control. The Forebay is materially undersized to properly manage the nonpoint source storm water drainage piped into it from both inside South Bethany and outside South Bethany. 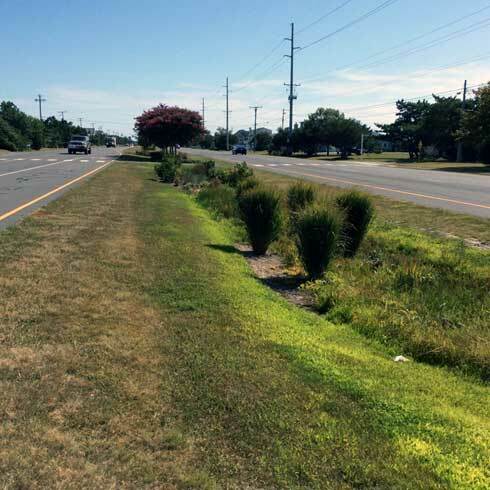 This photo taken by Tony Caputo on September 7, 2015 is of a bioretention (rain garden) area located on DE. Rt. 1 in South Bethany. The bioretention area was created to catch and hold “excess” nonpoint storm water runoff from Rt. 1. Within the bioretention area there is a now elevated storm drain that sends storm water to the Anchorage Canal Forebay in some instances. Prior to building of the bioretention area much more nutrient rich storm water ran directly into the Forebay. The nutrient rich water is pooled in the bioretention area where it is filtered and over a period of days it is absorbed into the underlying soils and used by the plantings. Other NPS pollution solutions are much more complex to fix because the pollutants may have entered the system from farm fertilization many years before they finally enter surface water. Solving these pollution problems will take years. Solutions to farm run off may include strategically situated tree stands, cover crops and buffer vegetation. The results of these actions are not quick fixes and require patience. DENREC’s NPS Program is “committed to addressing the issue of nonpoint sources pollution as it affects Delaware’s numerous waterbodies”1 DENREC receives funding from the US Environmental Protection Agency (EPA) and the State of Delaware. DENREC’s NPS Program activities include grant funding, education, outreach, and partnerships with other organizations working to reduce NPS pollution in Delaware. They also promote specific best management practices (BPM) that address “agriculture, nutrient relocation, construction, silviculture, septic systems and hydro modification activities” 2. Pet and livestock wastes run off. The Inland Bays Foundation advocates and promotes the restoration of the Inland Bays watershed by conducting public outreach and education, tracking restoration efforts, encouraging scientific inquiry and sponsoring needed research, in order to establish a long-term process for the protection and enhancement of the Inland Bays.